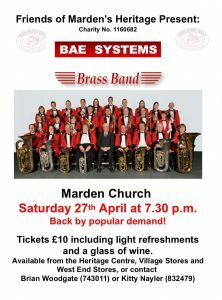 The band is busily preparing for its much anticipated return to St Michael and All Saints Church in Marden. Our first appearance there was in April 2018 and we are delighted to be performing in this lovely venue once again. The concert commences at 7.30pm with an admission charge of £10 which includes a glass of wine. The Band was delighted to play for the Company Carol Service once again on Monday 10th December. The service featured congregational carols, which the band accompanied, a number of readings, four band slots, a mass Twelve Days of Christmas and a now regular appearance from the Ukulele Band who performed a number of Christmas hits in their own inimitable style.